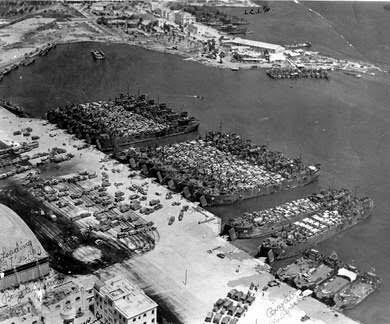 Left: Early 1943; aerial view of Oran harbor, Algeria. Right: 1943; a GI distributes food to French kids in Oran, Algeria. The 2644th Graves Registration (QM) Detachment was organized in Oran, Algeria (North Africa), 23 March 1943, per Special Order No. 31, Section 11, Mediterranean Base Section, dated 22 March 1943. On 25 March 1943, Second Lieutenant Dale E. Webb was assigned and joined the organization as Detachment Commander. On 26 March 1943, Second Lieutenant Walter J. Froman, joined the Detachment. On 3 April 1943, Second Lieutenand James Glendinning was assigned and joined the unit. On 18 August 1943, the 2644th Quartermaster (GR) Company (Prov) was activated under T/O & E 10-297, dated 21 January 1942, per Paragraph 3, General Order No. 95, Headquarters Mediterranean Base Section, dated 17 August 1943. Strength: Two (2) Officers and 21 Enlisted Men pertaining to the 2644th Quartermaster (GR) Detachment were absorbed and formed the cadre for the Company, with Second Lieutenant James Glendinning being appointed Company Commander. At the time the unit comprised 2 Officers and 20 EM for Company Headquarters; and 1 Officer and 24 EM for each Platoon (4 Platoons provided). As per the T/O & E authorized strength consisted of 6 Officers and 129 Enlisted Men. On 20 October 1943, 101 Enlisted Men, limited service personnel, were assigned to the new Company. On 24 October, 4 new Officers were assigned to the organization: Second Lieutenants Gerald W. Giebner; Robert W. Goldberg; Selden A. Lawe; and Alan J.Oster. On 12 November 1944, Second Lieutenant Dale E. Webb was relieved of assignment and rotated to the Zone of Interior. The 3044th Quartermaster Graves Registration Company was initially organized as a “limited assignment Company” to operate Graves Registration Service in Theater rear areas and to maintain and beautify all cemeteries under their jurisdiction. This new organization was assigned to the Mediterranean Base Section (MBS, with Headquarters in Casablanca, French Morocco –ed). 1943; Casablanca, French Morocco. 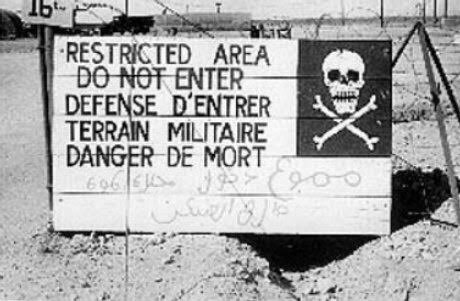 Sign at entrance of US Military Base in Casablanca. Upon receipt of personnel on 31 December 1943, the men absorbed from the 2644th QM (GR) Co formed a cadre for the purpose of training in Graves Registration Service operations. The 3044th Quartermaster Graves Registration Company was officially activated in Oran, Algeria, effective 1200 hours, 31 December 1943. Authority for this organization was contained in First Endorsement, Headquarters, MBS, Letter, dated 29 December 1943, Reference: Headquarters NATOUSA File AG.322, dated 3 December 1943: OB-I-SPMOU-M, dated 6 December 1943. Subject: Construction, Activation, and Transfer of Certain Units. A complete course in the functions of Graves Registration Service was carried out for a period of three full months, beginning on 21 December 1943. This training took place at the American Cemetery, Oran, Algeria, which at the time was operated by the 2644th QM (GR) Co organization. On 31 December 1943, the unit comprised 5 Officers and 124 Enlisted Men, all absorbed from the 2644th Quartermaster Graves Registration Company. 11 January 1944: First Lieutenant Gerald W. Giebner was relieved from assignment to the organization and from duty in the Theater, per Letter Order, Headquarters Mediterranean Base Section, dated 5 January 1944. 1943; Bizerte harbor area, Tunisia. Landing Ship Tanks are being prepared for Operation “Husky”, the Invasion of Sicily. 25 January 1944: 4 EM, operating the American Cemetery at Algiers, Algeria, were assigned to the organization, per Paragraph 24, Special Orders No. 20, Headquarters Mediterranean Base Section, dated 20 January 1944. 25 January 1944: 1 Officer and 25 Enlisted Men, designated as Fourth Platoon, 3044th Quartermaster Graves Registration Company, were placed on DS with the Eastern Base Section, by Authority Paragraph 1, Special Order No. 3, this Headquarters, dated 21 January 1944. The unit departed from Oran, Algeria, at 0900 hours, 25 January 1944, and arrived at the II Corps Cemetery, Mateur, Tunisia, at 1700 hours, 30 January 1944. 29 January 1944: Second Lieutenant William J. Houston, O-1292528,CoE, was assigned from Headquarters Mediterranean Base Section, Engineer Section, per Paragraph 1, Special Order No. 29, Headquarters MBS, dated 29 January 1944. He was to remain on DS with the 56th Quartermaster Sales Company, for a period unknown. 7 February 1944: Second Lieutenant Earl V. Balthasar, Jr., O-1585136, QMC, was assigned by Headquarters Mediterranean Base Section, Paragraph 4, Special Order No. 38, Headquarters MBS, dated 7 February 1944, to join the organization as from 1500 hours, this date. 10 February 1944: Second Lieutenant William J. Houston, was relieved from assignment to the 56th QM Sales Co, per Paragraph 12, Special Order No. 48, Headquarters MBS. 20 February 1944: Headquarters 3044th QM GR Co and Second Platoon left the American Cemetery, Oran, Algeria, at 0845 hours, on 20 February 1944 enroute to Bizerte, Tunisia, as per Letter Headquarters MBS, Movement Orders, File AG 370.5, M-BMCDE-M, dated 17 February 1944. 24 February 1944: Headquarters and Second Platoon arrived in Constantine, Algeria, at 1430 hours the same day, and Second Platoon was detached to the rear echelon, Eastern Base Section, Constantine, Algeria, as per VOCO, EBS. 25 February 1944: Captain Mark J. Gill, O-404119, QMC, was assigned from Personnel Center No. 5, 7th Replacement Depot, per Paragraph 15, Special Order No. 48, Headquarters Personnel Center No. 5, 7th Repl Depot, dated 18 February 1944. 25 February 1944: Captain Mark J. Gill, was assigned to duty as Base Graves Registration Officer, for a period unknown, as per Paragraph 13, Special Order No. 56, Headquarters EBS and 8th Port, same date. “The Knickerbocker News”, Albany, New York, Zone of Interior, dated July 10, 1943, announces the Allied Invasion of Sicily. 12 March 1944: First Lieutenant James Glendinning, was appointed Effects Quartermaster, Eastern Base Section, per Special Order No. 72, Paragraph 3, same date. 17 April 1944: 1 Officer and 4 EM, with First Lieutenant Selden A. Lawe in charge, were detailed to disinter 3 American bodies from the Isle of Pantelleria (captured 11 Jun 43 –ed), and returned from their mission on 20 April 1944. 26 April 1944: Captain Mark J. Gill, returned from DS with Headquarters Eastern Base Section, QM Section, per Paragraph 13, Special Order No. 56, Headquarters EBS, dated 25 February 1944. 1 May 1944: Second Lieutenant Morris Menachem, Inf, was assigned from the 3894th Quartermaster Gasoline Supply Company per Paragraph 8, Special Order No. 122, Headquarters EBS, dated same day. 1 May 1944: Second Lieutenant Selden A. Lawe, was relieved from assignment and re-assigned to Personnel Center No. 5, per Paragraph 10, Special Order No. 122, Headquarters EBS, dated same day. 13 May 1944: Captain Mark J. Gill, QMC, assumed command of the unit, replacing First Lieutenant James Glendinning, per Paragraph I, Special Order No. 3, Headquarters MBS, same date. 18 May 1944: 1 Officer and 25 EM of Fourth Platoon, were attached to Island Base Section, per Paragraph 1, Special Order No. 13, Headquarters Mediterranean Base Section, dated 11 May 1944. The group left at 0900 hours, the same day. 26 May 1944: 1 Officer and 3 EM, with First Lieutenant James Glendinning in charge, were detailed to the Islands of Lampedusa (captured 12 Jun 43 –ed) and Linosa (captured 13 Jun 43 –ed) for disinterment of 3 American bodies. They successfully recovered 4 bodies, as instructed by Paragraph 22, Special Order No. 147, Headquarters Eastern Base Section, dated same day. The detail returned to their proper station after completing disinterment works on the islands 1 June 1944. 13 June 1944: the 3044th QM GR Co (less 2 Platoons) was relieved from assignment to the Eastern Base Section and re-assigned to the Peninsular Base Section (PBS), effective the same date. 16 June 1944: a small detail headed by First Sergeant Max E. Meyer assisted by 2 EM, was sent to the Island of La Galita for disinterment of 2 American soldiers. They only recovered 1 body, as instructed by Paragraph 7, Special Order No. 163, Headquarters Eastern Base Section, dated 11 June 1944. They returned to their proper station by 17 June 1944. 17 June 1944: the 3044th QM GR Co (less 3 Platoons and Detachment of 1 Officer and 2 EM) was temporarily attached to the Eastern Base Section, pending call by the Peninsular Base Section, Paragraph 5, Letter Headquarters PBS, dated 17 June 1944; Subject: Unit Assignment and Attachments. 26 June 1944: First Lieutenant James Glendinning was relieved from assignment and duty from the 3044th QM GR Co and re-assigned to Headquarters NATOUSA, per Paragraph 8, Special Order No. 175, Headquarters EBS, dated 23 June 1944, Authority; NATOUSA Cable FX-62968, dated 22 June 1944. 29 June 1944: 1 Officer assisted by 2 EM were detached from the parent unit and attached to the Eastern Base Section, for a period unknown, per Paragraph 5, Letter Headquarters PBS, dated 17 June 1944; Subject: Unit Assignment and Attachments. 29 June 1944: the 3044th QM GR Co (less 3 Platoons and Detachment of 1 Officer and 2 EM) were released from attachment to the Eastern Base Section, and left Bizerte, Tunisia, at 1400 hours, same date, enroute to their new station in the Peninsular Base Section. 3 July 1944: the 3044th QM GR Co (less 3 Platoons and Detachment of 1 officer and 2 EM) arrived at their new station, Naples, Italy, Peninsular Base Section, and were assigned billets with First Platoon, 602d Quartermaster Graves Registration Company (with prior experience in Algeria and Tunisia –ed) at Maddaloni, Italy, effective 3 July 1944. 11 July 1944: a Detachment comprising 1 Officer and 2 Enlisted Men pertaining to Third Platoon, were detached from the parent unit and re-attached to the Eastern Base Section, per Letter Headquarters MBS, dated 11 July 1944; Subject: Movement Orders. 17 July 1944: Fourth Platoon (less 1 Officer and 2 EM) of this Company, was released from attachment to the Island Base Section and reverted to control of its parent unit, effective the same date. July 25, 1943; somewhere in Sicily. A patient is carried aboard a C-47 cargo plane for air evac to North Africa. 18 July 1944: The Detachment of Fourth Platoon, this Company, was relieved of attachment to the Island Base Section, and re-attached to the Northern Base Section, Palermo, Sicily, per Paragraph 3, Letter Headquarters Peninsular Base Section, dated 17 July 1944; Subject: Unit Assignment and Attachments. 27 July 1944: Third Platoon (less Detachment of 1 Officer and 2 EM) of this Company, was relieved of attachment to the Mediterranean Base Section, and reverted to full control of its parent unit. During the first half of August 1944, the Company was stationed at Maddaloni, Italy, training and orienting personnel in the mission to be fulfilled. From 1 August to 3 August 1944, a Detachment of 7 EM pertaining to Second Platoon, was engaged in relocating graves of 85 enemy dead in the American Cemetery at Avellino, Italy. Another Second Platoon Detachment comprising 9 EM was temporarily stationed at the Cemetery at Carano, Italy, until relieved by 4 men pertaining to Third Platoon on 10 August. On 2 August 1944, another Detachment of Third Platoon numbering 7 EM moved to the Marzanello-Nuovo Cemetery, preparatory to the scheduled movement of the whole Platoon there as official GRS personnel tasked with the maintenance of the Cemetery. The balance of Third Platoon (less 4 EM on duty at the Carano Cemetery) joined the Detachment at Marzanello-Nuovo on 10 August 1944. An advance party of 9 EM of Fourth Platoon was detached to Nettuno for training and orientation with the 48th Quartermaster Graves Registration Company in problems peculiar to Graves Registration in the Anzio-Nettuno area. Control and responsibility of the Nettuno Cemetery was then shifted from Fifth United States Army to the Peninsular Base Section, and Company Headquarters, Second Platoon, and the balance of Fourth Platoon, were subsequently transferred to Nettuno on 15 August to relieve the 48th QM GR Co there. The FIRST burial for which the 3044th QM GR Co was responsible took place on 8 August 1944. However, the Company did not assume responsibility for maintenance of the Cemetery until 20 August! Upon departure of the 48th QM GR Co from the area (20 August 1944 –ed), the Company was charged with continuing search of the battlefields and tasked with a beautification program. Interments between 20 and 31 August 1944 totaled 6 American burials – 34 American reburials – and 15 enemy dead reburials. On 31 July 1944, the Officer personnel of the 3044th QM GR Co was increased by the arrival of Second Lieutenant Allen W. Vaughan, QMC, assigned from the 3272d Quartermaster Service Company, per Paragraph 4, Special Order No. 140, Headquarters Adriatic Depot, effective same date. He was to became the new Executive Officer. From February 1943 through January 1944, Base Sections in the North African Theater (NATO, later changed to NATOUSA –ed) were responsible to Headquarters, NATOUSA. Each Base Section CO was in charge of his own troops and facilities. Except for their supply activities, directed by the Services of Supply, the medical work of the various Base Sections was supervised by the medical section at Theater Headquarters. In addition to the Surgeon and his Executive Officer, the medical offices of the Base Sections usually included subsections for hospitalization, evacuation, supply, medical records, dental, veterinary, nursing, personnel, preventive medicine, graves registration services, fiscal, and administration. The “News Chronicle”, a British newspaper dated September 9, 1943, announces the unconditional surrender of Italy to the Allies. Between February 1943 and January 1944, 4 additional Base Sections were established in the North African Theater of Operations. The original two, the Mediterranean Base Section, with Headquarters in Oran, Algeria, and the Atlantic Base Section, with Headquarters in Casablanca, French Morocco, continued to operate at rear areas in the Communications Zone. The Eastern Base Section, established 20 February 1943 to support II Corps during the Tunisian campaign, was first located in Constantine, Algeria in the rear of the forces fighting in Tunisia and later in Tunisia itself (Mateur –ed) and at this time was the Base Section closest to Sicily during the campaign for that island. After the beginning of the Italian campaign, it became a base between the forward and rear areas of the Communications Zone, in fact the equivalent of an intermediate section, although not so termed. The Island Base Section was activated in Palermo, Sicily, on 1 September 1943, in the wake of the Sicilian campaign. On 1 November, about 2 months after the invasion of Italy, what was to become the major Base Section of the whole Theater, the Peninsular Base Section was created on the Italian mainland; it operated in support of Fifth United States Army throughout the Italian campaign. Finally, on 1 January 1944, the Northern Base Section was established in Corsica, chiefly to support Army Air Force units located there. During 1943, the Mediterranean Base Section became the key base section for storing theater supplies and for building up the adjoining Eastern Base Section. By the end of its first year of operation, it had a large concentration of fixed hospitals, and was considered to be the major area of fixed hospitalization in North Africa. Medical activities in the Atlantic Base Section reached a peak in June and July and dropped off sharply during the remainder of the year. At the end of 1943 its fixed hospitalization represented only a small fraction of the total in North Africa, but it continued to be used as a collecting point for transport of evacuees by sea and air back to the Zone of Interior. The mission of the Eastern Base Section, established in February 1943, was supply, hospitalization, and evacuation of local and II Corps troops during the Tunisian campaign. After the close of the campaign many fixed hospitals were located there, the number of fixed beds amounting to almost half the Theater total in July 1943. With succeeding campaigns to the north, a heavy volume of patients passed through the Base Section, first from Sicily and later from Italy. Near the end of the year the number of its medical units and installations decreased, but the number of patients in its hospitals reached a peak in December of 1943. With the arrival of temporarily attached and new medical personnel, the medical section was expanded, reorganized, and moved to a new location of the Base Section with Headquarters in Mateur, Tunisia. It made its final move the following month when Headquarters was transferred to Bizerte. The Island Base Section was established in Sicily from the nucleus of a Base Section initially known as the 6665th Base Area Group, which had accompanied Seventh United States Army. Its Headquarters medical section was formed in late August of 1943 and started operating when the Base Section was activated at Palermo, Sicily, on 1 September. The territory under Island Base Section control consisted of the region around Palermo and Termini as well as other sites where US Army depots were located. By October 1943, the Island Base Section had taken over from Seventh US Army the usual administration of hospitals, the handling of medical supply, and the maintenance of sanitary conditions for troops assigned to this Base Section. At the end of the year, all the Island Base Section medical installations were centered in and around Palermo. No significant concentration of medical units occurred in Sicily, for few evacuees from combat in Italy went to North Africa by way of Sicily, and for these the stopover was brief. The unit that was to become the Headquarters for the Peninsular Base Section on the Italian mainland, the 6665th Base Area Group, was activated 21 August 1943 in Casablanca. It obtained a medical section, made up of 8 Officers, 1 Warrant Officer, and 14 Enlisted Men, from the Atlantic Base Section. This group left Casablanca, French Morocco, in three echelons, all reaching Naples, Italy, by early October. 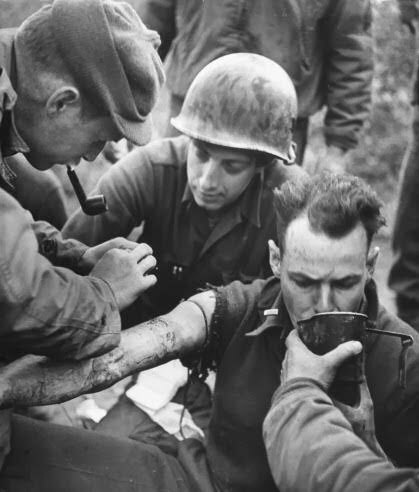 Until that time, the Fifth United States Army Surgeon, Colonel Joseph I. Martin, MC, had acted as a Base Surgeon, supervising hospitalization, evacuation, supply, and sanitation, as the task force surgeons had done in the North African invasion before Base Section personnel arrived. The 6665th Base Area Group medical section worked closely with Colonel J. I. Martin’s staff. The Peninsular Base Section was established in November of 1943 with Headquarters in Naples, Italy. The Surgeon’s office of the Peninsular Base Section was already larger than that of any other Base Section in the Theater. With the advances into Italy, the North African bases had diminished in importance and the Peninsular Base Section became the major Base Section in the Theater, both in terms of personnel and in the number of fixed beds, reaching a peak in August of 1944. The Northern Base Section, comprising the Island of Corsica (captured 6 Oct 43 –ed), with Headquarters located in Ajaccio, became the sixth Base Section in the Theater after being established 1 January of 1944. Maintenance and care of the 4 American Cemeteries (Caronia, Gela, Licata, Palermo –ed) in Sicily remained the responsibility of 1 Officer and 2 Enlisted Men of Fourth Platoon. The Detachment was stationed in Palermo, Sicily, and attached to the Northern Base Section, Palermo, Sicily, but remained under the direct supervision of the Graves Registration Service Officer, Peninsular Base Section. Licata Cemetery was already closed on 11 August 1943. While the Gela Cemetery was originally opened by the 48th Quartermaster Graves Registration Company it was closed to further interments 19 August 1944 by the 3044th QM GR Co. Caronia closed for interments the same date. A Detachment comprising 1 Officer and 1 Enlisted Man of Second Platoon, plus 1 other EM of Company Headquarters, were still on duty with the Eastern Base Section to supervise GRS functions in the 9 American Cemeteries of Western Algeria (Algiers, Constantine, Oran, Souk Ahras, Tébessa –ed) and Tunisia (Bizerte, Gafsa, Mateur, Tunis –ed). Command responsibility for maintenance of these cemeteries, together with the 3 other cemeteries in the Casablanca, French Morocco area, was assigned to the Mediterranean Base Section. GRS personnel required as a result of this mission were made available from First Platoon, which had previously been servicing the Oran Cemetery in Algeria. November 11, 1943; Veterans’ Day. Palermo Cemetery, Sicily; Lieutenant General George S. Patton, Jr., CG Seventh United States Army places a wreath in the cemetery to honor the fallen. General maintenance and upkeep of the Ksar Mezouar, Bédja, Hadjeb-el-Aouin Cemeteries, remained the responsibility of the Tunis GRS Detachment. During the period of September 1944, personnel pertaining to Company Headquarters, Second Platoon, and Fourth Platoon, were continuously engaged in searching the Beachhead battlefields, seeking out isolated burials of missing American aircrews, and improving the appearance of the Nettuno American Cemetery, while Third Platoon men continued to service the Marzanello-Nuovo and Carano American Cemeteries. While combing the battlefields for any isolated burial sites, it was often necessary to enlist the aid of trained Engineer personnel for mine clearance operations. Enlisted Men for this particular activity were recruited from the 357th Engineer General Service Regiment (colored unit, arrived in Italy 22 Jun 44 –ed), who left nothing to be desired in their attentiveness to duty, spirit of cooperation, and coordination of all efforts in the recovery of remains of American dead. Searching parties in and around Lanuvio, Italy, observed that Italian civilians had plundered, burned, and buried with loss of identity, an unknown and undetermined number of American bodies who had fallen in battle in that area. This information, together with evidence gathered by the searching party, was turned over to the Provincial Public Safety Officer, Rome-Littorio Province. Three (3) Enlisted Men serving with the 345th Engineer General Service Regiment (arrived in Italy 3 Oct 43 –ed), with road grader and bulldozer arrived on 16 September, and put into operation plans for improving the general appearance of the Nettuno American Cemetery. Gravel required for roads, walks, and drives was obtained from a quarry at Velletri. Transport for hauling gravel and earth was furnished by a Quartermaster Trucking Company operating out of Rome. In September 1944, the 3044th was directed to disinter the remains of 8 American soldiers who had been taken prisoner and executed by the Germans in April 1944, in a churchyard of the St. Benedetto Church atop Monte Buono (date of death was confirmed to have been 13 Apr 44 –ed). A full investigation took place and a special party was sent to Monte Buono in order to verify reports and determine the exact location of the graves. After going through interviews and testimonies from local people, the detail proceeded back to the execution site for disinterment of the remains. They were eventually transported to the Nettuno American Cemetery where reburial was made in individual graves. Left: December 1943; Italy. Covered American dead waiting to be collected by a Graves Registration detail. Right: December 25, 1943; Christmas services celebrated somewhere in the field in Italy. On 30 September 1944, Captain Gerald B. Stein, MC, accompanied by 6 EM of the 114th Station Hospital, were attached to the 3044th QM GR Co to operate an area Dispensary. Interments for September 1944 included 29 American burials – 139 American reburials – and 72 enemy reburials. No real operational changes were experienced during the month of October 1944 insofar as increases or reductions in the number of cemeteries for which the Company was responsible. The unit still operated less First Platoon. On 17 October, the 75th Quartermaster Service Company (Italian) with a complement of 4 Officers and 196 Enlisted Men was attached to the Company for operational control only, with the purpose of augmenting the Italian civilian labor force engaged in improving and beautifying the Nettuno Cemetery. 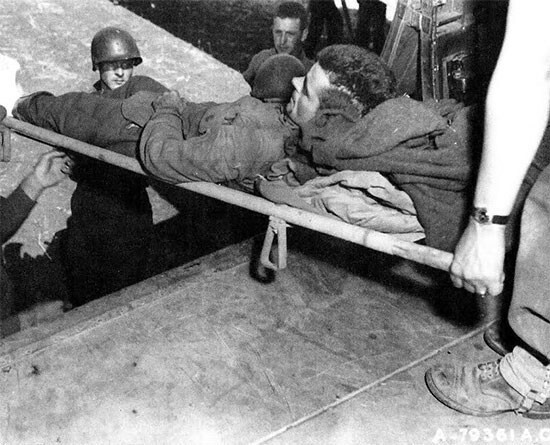 One (1) Medical Officer assisted by 6 EM of the 114th Station Hospital (arrived in Theater 2 Jun 43 –ed) operating the Company Dispensary, were relieved from duty by Captain A. W. Bonanno and 3 EM pertaining to the 154th Station Hospital (arrived in Theater 2 Apr 44 –ed). The total number of interments that took place in the Nettuno American Cemetery included 10 American burials – 113 American reburials – and 49 enemy reburials. During November 1944, elements of the 3044th QM GR Co (less its First Platoon) stationed at Nettuno, Italy, continued operations at the American Military Cemetery there, while Third Platoon continued its task of searching for isolated burials, concentrating smaller cemeteries, and maintaining those established in the Naples-Cassino area. Three to four disinterring details were dispatched daily from Nettuno. This resulted in the recovery of 44 American remains and the removal of 104 enemy remains from the Beachhead battlefield at Anzio-Nettuno during this period. Disinterment parties were also called upon to conduct numerous investigations in attempts to locate missing personnel and to assist with the identification of deceased interred as “unknowns”. February 1944; Anzio Beachhead, American Hospital Sector. A patient is being treated by a member of the Medical Department. The improvement and beautification program of the Nettuno Cemetery was taking shape and already offered a well-kept appearance, but completion of the program was not progressing as anticipated, due to adverse weather conditions, along with the delay in getting vital and necessary materials on site. Delivery of the necessary gravel was delayed by a lack of transportation, and the inability to obtain the standard Theater GRS Greek Crosses and Stars of David prevented the replacement of the original markers in the American section and the installation of simple Greek Crosses in the enemy section of the cemetery. In November 1944 command of the 3044th Quartermaster Graves Registration changed with Captain Mark J. Gill, being relieved as Company Commander to assume full duties of Graves Registration Service Officer, Peninsular Base Section, Italy, and First Lieutenant Allen W. Vaughan, QMC, taking over as Commanding Officer. The overall number of interments that were effected during the month of November 1944 included 4 American burials – 44 American reburials – and 104 enemy reburials. December and the close of the year 1944 marked one year of operations as the 3044th QM GR Co, since its redesignation from the 2644th Quartermaster (GR) Company (Prov) 31 December 1943. The Company had meanwhile moved out from Oran, Algeria, and gradually taken over all American Cemeteries in French West North Africa and Sicily, as well as those in Italy in the vicinity of Monte Cassino and the Beachhead at Anzio-Nettuno. As 1944 closed, personnel of First Platoon were stationed at all US Military Cemeteries in French Morocco, Algeria, and Tunisia. One (1) Officer, assisted by 2 Enlisted Men were retained in Sicily to supervise the maintenance of the 4 Cemeteries there. Third Platoon continued to be in charge with the responsibility for the Carano, Marzanello-Nuovo, and the R. Fratelle Cemeteries in the Naples-Cassino area, while the balance of the Company consisting of Headquarters, Second, and Fourth Platoons continued operations at Anzio. The first casualties hit the company on 7 December 1944, when one member of a disinterring detail was killed instantly and 2 others seriously wounded by shrapnel from the explosion of an enemy anti-personnel mine while engaged in searching for isolated burial sites in the Beachhead battlefield at Anzio-Nettuno. The completion of the improvement and beautification program of the Nettuno Cemetery was still handicapped by inadequate transportation and delay in receiving the appropriate grave markers. Since an improved delivery schedule of the markers was impossible, the program could not be completed for approximately another five or six months. Record of interments for December 1944 totaled 17 burials and 17 reburials of American dead and burial of 33 enemy dead. 1943 – 1944 charts illustrating the development of the various “Base Sections” in NATOUSA / MTOUSA. During the course of January 1945, personnel of the 3044th Quartermaster Graves Registration Company, Headquarters, Second Platoon, and Fourth Platoon (less First Platoon), continued to search the Anzio Beachhead battlefields, and improve the appearance of the Nettuno American Cemetery. Third Platoon, meanwhile continued to maintain the Carano and Marzanello-Nuovo American Cemeteries in the Naples and Monte Cassino areas, and further engaged in the search for isolated burials. The isolated location of the Nettuno unit with its varying and straining needs accentuated the limitless flexibility of human adaptation. 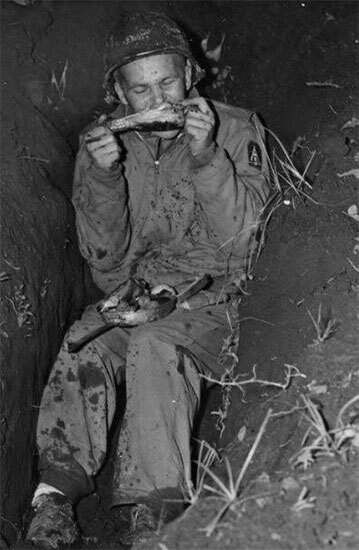 The great versatility of duties performed by the personnel included operating a mess hall along the lines of a cafeteria subject to prepare meals at all hours of the day, because of the influx of returning disinterment crews and the movement of transients and visitors to and from the Cemetery. The number of disinterring parties dispatched daily from the field installation was further reduced by the necessary allocation of 1 vehicle for the purpose of hauling water. Control over the water point by another detail would only have added to the duties of the heavily overburdened unit personnel. In addition to the foregoing, a unit Dispensary was also maintained under the supervision of the attached Medical Officer. Delays in the improvement and beautification of the Nettuno Cemetery continued because of the inadequate facilities for hauling crushed rock and gravel, and the limited number of standard grave markers on hand. The search of the battlefields for remains and the conducting of special investigations into the isolated burials, especially those of missing airmen, constituted the intensified operational program with which the organization was occupied. Enlisted Men detailed for mine clearance operations were recruited on a regular basis from the 357th Engineer General Service Regiment. Their performance helped recover a number of bodies which were known to be located in mined areas. The number of interments for January 1945 was 46 burials and 2 reburials of American dead and 56 burials of enemy dead. The most important happening, affecting the operational efficiency of the Company took place in February of 1945. 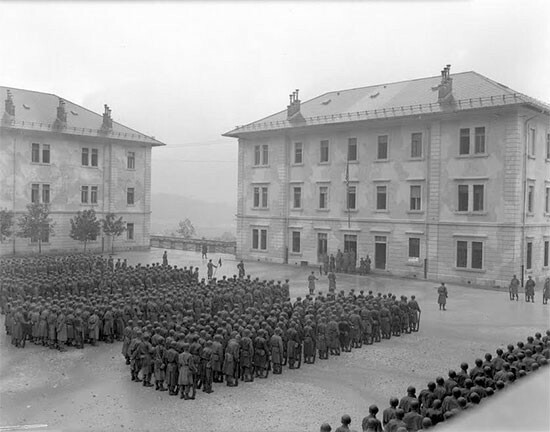 The release of First Platoon (less personnel and equipment) from attachment and duty with the Mediterranean Base Section, and its return to control of the 3044th QSM GR Co Headquarters for service in the Italian Theater was important, although the loss of First Platoon personnel to the newly-formed 3076th Quartermaster Service Platoon, necessitated activation of a complete and new Platoon to assist in the mission of servicing and maintaining the growing number of cemeteries coming under the Company’s control in Sicily and Italy. This increase in manpower, together with the issue of additional equipment above regular T/E allowances (authorized by Letter Headquarters MTOUSA, AG File 400.34/798 D-O, dated 18 February 1945 –ed) helped to meet the most exacting specifications required of the Graves Registration Service Division, and to continue to be deserving of the Letter of Commendation from the Quartermaster General on the manner of performance of duty, Graves Registration Service (Reference Letter from Army Service Forces, Office of the Quartermaster General, Washington 25, DC, AG File 330.13 BPPCG, dated 13 December 1944, signed by Brigadier General H. A. Barnes, QMC, Deputy The Quartermaster General –ed). Left: Palermo Cemetery; initially opened by the 48th QM GR Co July 24, 1943. Center: Paestum Cemetery, Italy; initially opened September 20, 1943 by the 47th QM GR Co. Right: Nettuno Cemetery, Italy; initially opened January 24, 1944 by the 48th QM GR Co.
During February, disinterment details maintained contact with local farmers returning to their lands and who were able, through their observations, while cultivating the fields, to guide search parties to deceased personnel who had met their death in isolated positions while on patrol or on other missions. Since past experiences had proved that identification tags (dog tags) present with the remains did not always establish definite and positive identification, parties were carefully examining and making notes of all discovered clothing and equipment, personal effects, letters, papers, documents, and other such identifying markings present with the remains, for use as a crosscheck against the identification carried by the dog tags. Recoveries and subsequent interments in the Nettuno Cemetery for the month totaled 49 American dead and 72 enemy dead. The only operational change occurring during March 1945, was the detaching of 1 Section from the Company to service and maintain the American Cemetery located at Tarquinia, Italy. The duties of this Detachment also covered locating, investigating, recovering, and identifying the remains of missing American aircrews, in combined operations with the 2616th Repatriation Unit, 12th Army Air Force (in Italy the search for American aircrews who failed to return from sorties over the country, was shared with the 2611th – the 2612th – and the 2613th QM GR Cies –ed). The improvement and beautification program of the Nettuno Cemetery was finally progressing satisfactorily insofar as the replacement of grave markers was being affected. However, it was evident that the assistance of Engineer personnel and heavy equipment was required to complete the necessary grading and roads. Overall interments at the Nettuno Cemetery for the month of March totaled 66 American burials – 20 American reburials – and 64 enemy reburials. The advance of the Allied Armies in Italy in spring, and more particularly during April 1945, affected the 3044th QM GR Co operationally, in that 2 more American Cemeteries were added to those already being maintained and beautified by elements of the organization. 1944; somewhere in Italy. Wounded French soldiers are evacuated by 3/4-ton ambulance to the nearest Hospital for treatment. Work was begun on a water sprinkling system required by the improvement program for the Carano, Marzanello-Nuovo, and Nettuno Cemeteries. City water mains provided the necessary supply for the Carano Cemetery, while a well adjacent to the area, supplied the Marzanello-Nuovo Cemetery. At Nettuno, water was pumped from a mountain stream, running parallel to the Cemetery, only about 100 yards from its western boundary. Once more, road construction at the Nettuno American Cemetery was delayed due to the absence of heavy Engineer equipment. Working parties engaged in combing and searching the Anzio battlefield areas for isolated graves, were now limited in numbers, due to the wide deployment of personnel to the other cemeteries. Interments for the month of April 1945 registered 21 American burials – 18 American reburials – and 10 enemy reburials. Operations during the month of May 1945, focused on preparations for the “Memorial Day” services to be held at all American Military Cemeteries under the control of the Company. Among the distinguished guests who attended the services on Wednesday 30 May 1945 (date respected everywhere, also in the European Theater –ed) were: Lieutenant General Lucian K. Truscott, Jr., CG Fifth United States Army; Major Daniel John W. O’Daniel, CG 3d Infantry Division; Brigadier General Thoburn K. Brown, CG Rome Allied Area Command; Senator Burton K. Wheeler, and British Officers, who placed wreaths and held speeches. At this time, Nettuno Cemetery held 6,614 American and 2,723 German graves. Nine hundred (900) Fifth US Army Officers and Enlisted Men, returned to this hallowed ground of the never to be forgotten Anzio Beachhead, to pay tribute to their fallen comrades. The water sprinkling system was completed and grass sown throughout the cemetery complex at Nettuno. Meanwhile Engineer personnel and equipment had arrived to begin work on the rear area where a chapel was to be constructed and on the road system. There were still 1,266 old wooden grave markers left to be replaced. 1944, Italy. 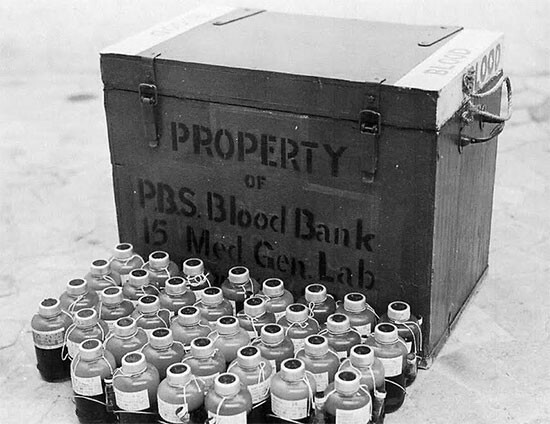 Blood flasks prepared by the Peninsular Base Section for use in the field. Third Platoon, located at the Marzanello-Nuovo Cemetery removed the enemy section at R. Fratelle, and re-interred 288 enemy dead at the Carano Cemetery, Italy, and another 59 enemy deceased at the Nettuno Cemetery. First and Second Platoons continued to service the other American Cemeteries at Castelfiorentino, Pietramala, Tarquinia, Follonica, and Vada, in Italy. The number of interments at the Nettuno Cemetery for the month was 17 burials and 4 reburials of American dead, and 49 burials and 59 reburials of enemy soldiers. Following V-E Day in Europe, there were 26 American Military Cemeteries within the limits of the Mediterranean Theater of Operations, US Army, 16 of which were located on the Italian mainland, 4 in Sicily, 1 each in Sardinia, Corsica, Greece, Bulgaria, Yugoslavia, Hungary, Rumania, and the Island of Vis (Adriatic Sea –ed). Of approximately 31,875 American dead in these cemeteries, approximately 3 1/2% were classed as “unknowns”. 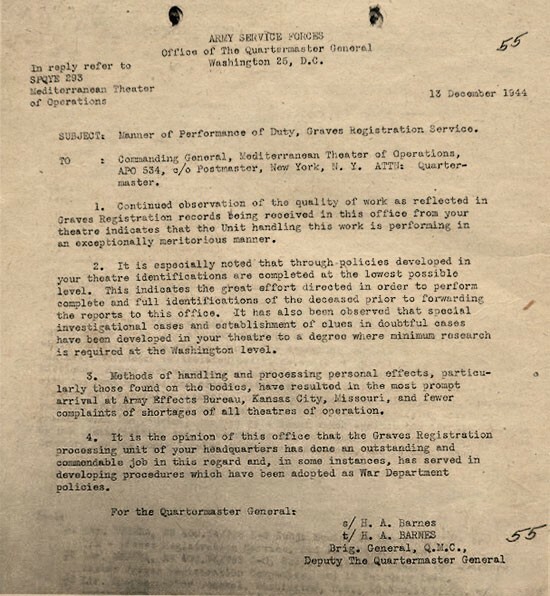 Headquarters, Mediterranean Theater of Operations, United States Army (MTOUSA), APO # 512, Office of The Chief Quartermaster published a concise report dated 30 May 1945, on “Graves Registration Service”. A list was included giving locations of 25 different temporary military cemeteries in the region. The different burial sites were located as follows: Sicily (Caronia – Gela – Licata – Palermo); Sardinia (Cagliari); Corsica (Bastia); Malta; Italy (Avellino – Bari – Carano – Castelfiorentino – Follonica – Granaglione – Marzanello-Nuovo – Mirandola – Naples – Nettuno – Paestum – Pietramala – R. Fretello – Senigallia – Tarquinia – Vada) + Croatia (Vis Island); Greece (Athens). In June of 1945, First Platoon was relieved from duty at the Castelfiorentino and Pietramala Cemeteries and established their CP at the Naples Cemetery, where they were charged with the general supervision of that Cemetery, as well as those established at Avellino and Paestum. First Lieutenant Siebold, First Platoon Commanding Officer, also served in the capacity of Graves Registration Officer, Southern District, Peninsular Base Section. First Lieutenant Holland was recalled from Sicily, to take over command of Third Platoon, relieving First Lieutenant Morris Menachem, who was placed on DS with the 61st Quartermaster Base Depot, as an Assistant GR Officer, for PBS. The Army Redeployment program necessitated a change in Enlisted personnel on duty at the cemeteries in Sicily with the following results. Sergeant Doble and Technician 5th Grade Hillenbrand, relieved Sergeant Dixon and Technician 5th Grade Engle. Second Lieutenant George E. Johnson joined the Company as the new Executive Officer, after having been awarded a field promotion with direct appointment from Technical Sergeant, 1 June 1945. Two (2) trained EM, Staff Sergeant Mervin D. Zabriskie and Corporal Cheng, were transferred from the Company and assigned to the 2616th Repatriation Unit, in line with Theater Graves Registration postwar activities relating to the recovery of Army Air Forces casualties. On 18 June 1945, the Nettuno Cemetery, Italy, was formally inspected by Edward Scheiberling, National Commander American Legion, and Mancel Talcott, National Chairman Graves Registration, American Legion. Both men were favorably impressed by the general appearance of the cemetery and maintenance of records. Overall interments at the Nettuno Cemetery for June totaled 16 American burials and 12 American reburials. “Letter of Commendation” dated December 13, 1944, addressed to the Chief Quartermaster in Italy, via the Commanding General, Mediterranean Theater of Operations, United States Army (MTOUSA), expressing the Quartermaster General’s (OQMG Washington 25, DC, ZI) great satisfaction with the performance of the GRS units in the Theater. Highlight of July 1945 was the award of the “Meritorious Service Unit Plaque” in recognition of a job well done and for superior performance of duty, as announced in General Order No. 189, Headquarters Peninsular Base Section, Italy, dated 19 July 1945. First Lieutenant Allen W. Vaughan, QMC, Commanding Officer 3044th Quartermaster Graves Registration, received the plaque from Colonel George H. Bare, Quartermaster Peninsular Base Section, in an appropriate ceremony at the 61st Quartermaster Base Depot Headquarters, Leghorn, Italy, on 21 July 1945. During the same month, First Sergeant Max E. Meyer and Staff Sergeant McHale received direct appointments as Second Lieutenants on 28 and 30 July 1945, respectively. They remained assigned to the Company and eventually took up duties as Commanding Officers of Fourth and Second Platoons respectively. It must be noted that the majority of the Cemeteries controlled by the 3044th were closed to future burials, with personnel busily engaged in completing necessary improvements preliminary to the departure of GRS personnel from the Theater and subsequent maintenance of the cemeteries by Italian civilians. In keeping with this program, construction was begun on standardized 2-room buildings at each cemetery to house the burial records as well as the necessary cemetery tools and equipment. Working parties and investigating squads recovered the remains of 31 American deceased from the surrounding battlefields for burial in the Nettuno Cemetery during July 1945. The total number of interments at Nettuno numbered 23 American burials and 8 American reburials. August 1945; operational changes during the month found First Lieutenant George C. Holland, Commanding Officer, and 19 Enlisted Men, of Third Platoon, assuming control of the Castelfiorento Cemetery, while a Section of Third Platoon remained on duty at the Cemeteries of R. Fratelle, Marzanello-Nuovo, and Carano, Italy. First Lieutenant Scoler was assigned the duty of GRS Officer in charge of these cemeteries and selected 7 EM from the Company at Nettuno, to reinforce the group selected from Third Platoon. Continued searching and combing of the Anzio-Nettuno Beachhead battlefield area resulted in the recovery of additional remains of 23 American dead. Burial services were held for 5 hospital deaths. No operational changes took place during September 1945. Elements pertaining to the 3044th were now stationed at the 11 Cemeteries located on the Italian mainland and the 4 other Cemeteries on Sicily, and were engaged for the most part in carrying out the various improvements directed by the GRS Command in the Peninsular Base Section. 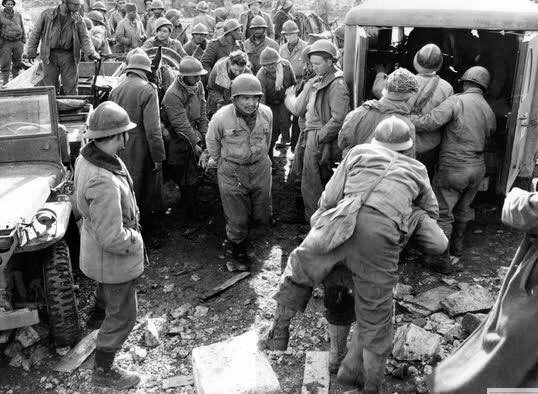 Searching details were still active in the Anzio Beachhead area and succeeded in uncovering the bodies of 15 American soldiers from isolated and unmarked graves throughout the battlefields. Another detail operating out of Follonica continued working on missing aircraft personnel in that region. Three (3) hospital deaths occurred at the 34th Station Hospital (arrived in Theater 11 May 43 –ed) in Rome, Italy; with the deceased being interred with military honors in the Nettuno American Cemetery. October of 1945 brought no eventful news except for one that would nevertheless affect the 3044th Quartermaster Graves Registration Company’s further activities. The drastic effects of Redeployment and Demobilization began to be felt as on 17 October 1945, First Lieutenant Allen W. Vaughan, the organization Commanding Officer, along with 6 Enlisted Men, were called to the 7th Replacement Depot for reassignment to the Zone of Interior. Second Lieutenant George E. Johnson now assumed command of the 3044th. On 22 October 1945, 4 more EM left for the Depot, and on 23 October, another one of the “old timers” departed via the 7th Replacement Depot. Nevertheless, the necessary and important works for improvement and beautification of the 11 Cemeteries in Italy and the 4 Cemeteries on Sicily continued to be efficiently carried out. Eighteen (18) new burials during the month of October were the results of the unceasing efforts of the Platoon search details that were continually active in their exploration for American dead in isolated or unmarked graves. Furthermore, the personnel were always alert to any calls emanating from the 34th Station Hospital (250-bed unit transferred to the Rome Area jurisdiction 25 May 45 –ed). When World War Two ended and hostilities were over in Italy, the Fifth United States Army had been in virtually continuous combat for 19 months. This meant that there was a heavy preponderance of high pointers in the Fifth US Army’s medical and other services. When redeployment was activated, this entailed that quite a number of medical units were either scheduled for direct redeployment to the Pacific Theater or listed for indirect redeployment. Consequently, contraction of operations and redeployment policies were certain to influence the situation in the Mediterranean region. At the end of the war in Europe, US Commanders in the Mediterranean Theater turned their attention to the war in the Pacific with the objective of reducing operations in Italy as rapidly as possible. Redeployment schedules for 1945 required the removal of many regularly constituted Graves Registration Companies from the European and Mediterranean Theaters where 2/3 of the war dead were buried! The question of redeployment came up again in March and May of 1945 and high pointers were transferred to units being returned to the ZI, while low score personnel filled the ranks of other units consistent with efficient operation (unfortunately personnel with low ASR scores remained insufficient to bring certain units up to T/O strength –ed). This inevitably caused the personnel situation to become critical as further withdrawals of personnel would certainly jeopardize services to combat formations remaining in the Theater. In August-September 1945, a change of policy was inaugurated whereby many units were to be inactivated in the Theater rather than be shipped back to the United States for inactivation. May 30, 1945, somewhere in Italy. Official formation for the celebration of the first postwar “Memorial Day”. Redeployment of units assigned to PBS followed more or less the same pattern that was applied by the Fifth US Army, and a great deal of adapting and amending became necessary. When inactivation was begun in Italy, this meant that a certain source of replacements was lost to the Quartermaster Graves Registration units, who had to deal with the problem as best they could. Furthermore, most units were completely re-equipped before embarkation, and in addition, large quantities of supplies, without specific relation to units, were sent to ports in the Pacific Area, lowering available stocks in the Theater. Although as stated above, the dislocation brought along by inactivation hampered planning in the area, these very circumstances tended to simplify rather than complicate problems at Mediterranean Headquarters. The Mediterranean Theater of Operations was not confronted with the difficult task of of conducting large and hastily planned evacuation of American remains from considerable regions of enemy territory about to be relinquished to Allied Forces or from those temporary Military Cemeteries that had been established in different Occupation Zones assigned to US Army Forces. They were thus able to avoid many of the burdens which affected American troops in Western Europe. Throughout the summer and fall of 1945, the bulk of the Allied Forces in Italy were being withdrawn, PWs were being returned to their homes (Italy, having co-belligerent status, was never to be occupied as would be Germany and Austria –ed) and services were being reduced to a minimum. The necessary organizational changes were implemented in order to bring overhead operations in line with local requirements. The Army tried to make the best use of experienced Officers and to replace higher with lower ranks as responsibilities and military operations contracted. When the Adriatic Base Command and the Army Air Forces Service Command, were discontinued, the Peninsular Base Section became responsible for medical and allied services for all United States Forces remaining in the Theater (one of the reasons to retain token American military forces was the border dispute between Italy and Yugoslavia and the problem of Trieste –ed). In line with the Army policy to contract the functions of the Base Sections, now almost exclusively concentrated in Leghorn, PBS was disbanded in April 1947, and its installations and responsibilities transferred to the Port of Leghorn – MTOUSA organization. By mid-November 1947, all personnel and supply surpluses had been either transferred to the Zone of Interior, the European Command, or to TRUST. On 3 December 1947, a last Army transport sailed out of Leghorn with all that was left of US Forces in Italy and MTOUSA – Mediterranean Theater of Operations, United States Army, ceased to exist. The War Department, with General Order No. 125, dated 29 December 1945, ordered the establishment of a separate American Graves Registration Service Zone Command (embracing the Mediterranean Theater and contiguous territories –ed), which became effective by transferring the 2621st GRU (Ovhd) from the Rome Area Command to the American Graves Registration Service, Mediterranean Theater Zone (AGRS-MTZ) where it was to function as a separate command, effective 1 April 1946. The new organization was subdivided in two Field Headquarters; Naples and Florence (on 15 December 1945, an Army Air Force Casualty Clearance Detachment was activated to continue the existing Casualty Clearance Program initiated by the 12th and 15th USAAF, in order to locate and identify aircrews , considered KIA or MIA; they operated 6 different teams in Italy and the Balkans –ed). In July 1946, Lieutenant Colonel Franklin E. Scott succeeded Colonel Wadsworth who not only remodeled Headquarters but expanded his staff level. During August, two separate Field Sector Units were activated; FSU No. 1 located in Naples, and FSU No. 2 in Florence (the latter was eventually moved to Leghorn in June 1947 –ed). Early in September of 1946, Colonel George King took over command, while Colonel Franklin E. Scott became Executive Officer. The 2621st GRU (Ovhd) was redesignated the 7109th Graves Registration Unit (Overhead) and all personnel transferred automatically. A change of policy was introduced with many competent Italian civilians joining the unit and replacing a number of American personnel. During the fall of 1946, the GRS Command in Italy was to devote its major attention to concentration of cemeteries in order to reduce the total number of burial grounds in the Zone and to bring remains closer together, thus preparing and simplifying the forthcoming Return Program effort. Furthermore, remains from the cemeteries located in Bulgaria, Greece, Corsica, Sardinia and Malta were transferred to Nettuno, Italy by C-47 aircraft and truck convoy. On 19 February 1947, Plenipotentiaries of the Allied Nations initiated the Peace Treaty with Italy, with ratification following 15 September 1947. This meant that all troops in the Theater other than residual would be out of Italy on or before R-Day + 90 and that AGRS-MTZ would become a self-supporting organization on R-Day + 5. 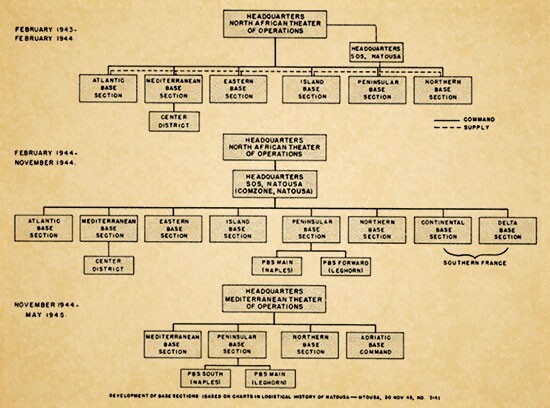 On that particular date (15 Sep 45 –ed), the Command was redesignated the American Graves Registration Service, Mediterranean Zone (AGRS-MZ) under control of The Quartermaster General in Washington. Authorized strength included 45 Officers – 5 Warrant Officers – and 87 Enlisted Men. In October 1947, a new Commanding Officer joined the unit; Colonel Whitfield Watson. A final reorganization took place on 1 December 1947 whereby the AGRS-MZ was once more redesignated and became the 9107th Technical Service Unit, Quartermaster Corps, American Graves Registration Service, Mediterranean Zone (9107th TSU, QMC, AGRS-MZ). As 1948 began, search and recovery activities in the Mediterranean Zone had been completed insofar as designated areas were concerned. Only scattered isolated recoveries, based upon specific information, still remained to be investigated. It was now time to consider the question of a permanent burial site in the Mediterranean … but that’s another story. The 3044th Quartermaster Graves Registration Company is awarded the Meritorious Service Unit Plaque for superior performance of exceptionally difficult tasks and outstanding devotion to duty in the Peninsular Base Section for the period 18 August 1944 to 19 May 1945. Outstanding devotion to duty has kept the number of deceased unknown at a minimum. Great initiative in the preservation of meager clues has favorably influenced identification which would have been impossible. Inadequate supplies were circumvented by ingenuity. Efficient cemetery operations have been carried out so that a scene of quiet, restful, and peaceful beauty meets the visitor’s eyes at the various cemeteries. The fact that each member is fulfilling an obligation to mothers, fathers, and wives of these fallen heroes means that the 3044th Quartermaster Graves Registration Company continues to hold high in the highest traditions of the military service in honoring its dead. The MRC Staff are looking for a Personnel Roster of subject unit, and are furthermore interested in securing data relating to late war (1945) operations of the 3044th Quartermaster Graves Registration Company in Italy. All inputs appreciated and sources will be indicated. Thank you.